Here’s the story of how I came to own these earrings. Some of the details have been left vague to protect the guilty (me). I was visiting an old timey shop that I have frequented in the past. This establishment sells fine jewellery as well as costume pieces. I went there because I lost an earring that I was awfully fond of before we moved. I hoped to find it during the packing up process, but that didn’t happen. I returned to the store because that is where I got the earrings in the first place. Luckily for me they had two sets of the same earrings, so I bought them both. Since I had just been paid, I boldly inquired about the price of a beautiful pair of lapis and gold earrings. The proprietor said, “those are gold. They’re $200.” That was too rich for my blood. 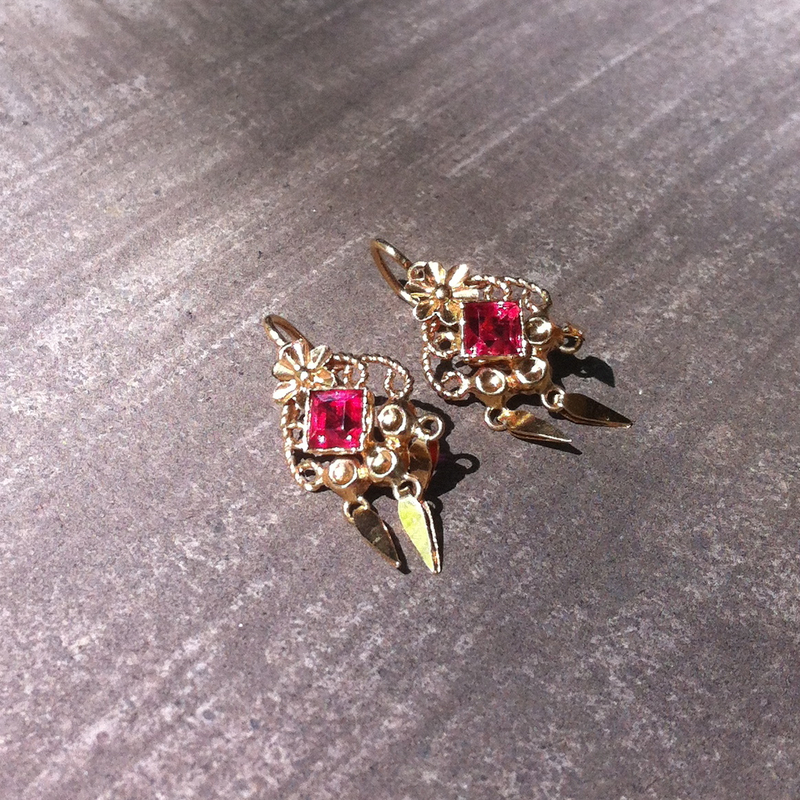 Then I noticed these earrings sitting in a jumble. I asked if I could have a look and the owner said, “oh those are just costume.” But i kinda knew that they weren’t because I have had these earrings before. I bought a pair from a Portuguese jewellery store that was going out of business about ten years ago. I asked how much and she said $25. I love getting a deal from places like the Value Village because they are a corporation. And I don’t mind sneaking one past a dealer either. But for some reason I felt guilty about not telling her that these earrings were not in fact costume, that they were 19k gold. I guess I can always assuage my guilt by going back and buying the lapis earrings one day when I am rich.